Reminiscent of a time-honored antique, this occasional table was designed in the classical European mold. The exquisite design dazzles with sinuously curved legs, carved bevels and bead moulding, and elegant bun feet. The table was constructed from select hard and soft woods with cherry veneers in a lustrous cherry finish. 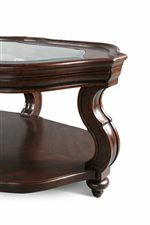 A tempered glass inlay opens up the top of the table for decorative displays, and leaves a clear view for items displayed on the bottom shelf. The Isabelle Traditional Oval Cocktail Table with Glass Top by Magnussen Home at AHFA in the area. Product availability may vary. Contact us for the most current availability on this product. The beauty of traditional, classic design transcends time and place, as seen in the sumptuous, elegant ornamentation of the Isabelle collection. This spectacular collection provides a cohesive pairing of upholstery and occasional tables, completing your room decor entirely, leaving just the accessories up to you. Wide-flared arms and striking toss pillows bring the classic look of the Isabelle sofa into the 21st century, also available on matching loveseat, chair, and ottoman. Isabelle tables continue the theme of exceptional, timeless design with elegantly carved shapes on lustrous cherry veneers. Traditional design is accessible to everybody with the breathtaking Isabelle group. The Isabelle collection is a great option if you are looking for furniture in the area. Browse other items in the Isabelle collection from AHFA in the area.